Not all black sweaters are created equal. And that's a fact. Also, you cannot have too many black sweaters in your wardrobe, and that's another fact. 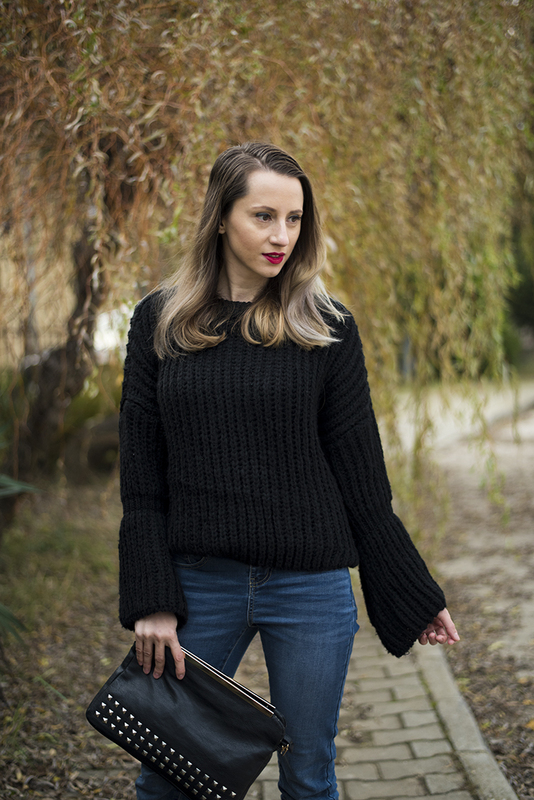 This season I fell in love with this bell sleeve chunky sweater and I'm going to wear it to pieces. It's so soft and cozy and the design is surely unexpected. I decided to dress it up a bit for its first outing, so I paired it with skinny jeans and purple pumps. I frayed the hems of the jeans myself a while ago and they look so much better when worn with high heels. Pretty soon it will be too cold for such an outfit, but I am sure I can find a myriad of other ways to wear my new favorite sweater. YAS girl! Love this jumper on you! Lovely for jazzing up your casual jumper with a bell sleeve one!